With a late entrance into an already over saturated market, Superior Vapour needed to quickly establish themselves as a competitor against the dominant vape retailers. Through a multi-channelled, integrated campaign, we built their online presence through strategic content marketing, social media, concentrated link building and PR outreach. Superior Vapour is an online vaping retailer, stocking high quality, well-curated vaping products from mods to juices. After working in the vaping business since its outset, founder Leigh setup Superior Vapour in 2015 with the intention to supply only the best equipment, sourced from around the globe, and establish Superior Vapour as the premium retailer at the forefront of innovation in vaping technology. 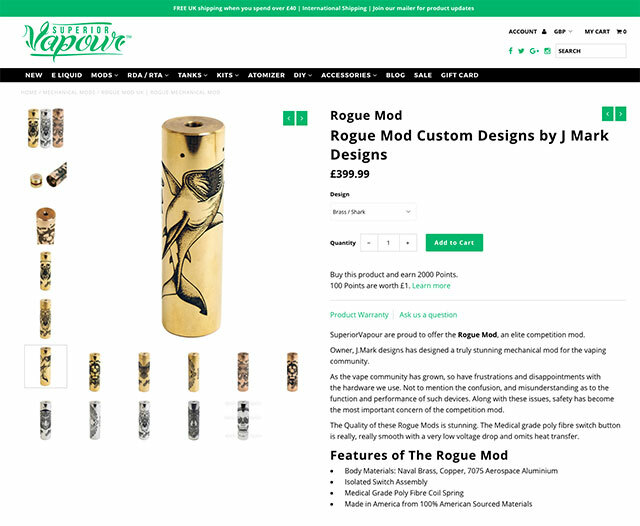 Based in Bristol but sourcing and selling equipment from all over the world, Superior Vapour needed our help to establish their online brand and attract business from a global and domestic market. Our aim was to push products onto page one of google and rank higher for key search words. To make Superior Vapour a clear frontrunner in the online vape retail market, and push their products into higher rankings and better visibility. To grow the Superior Vapour brand organically through better content, and to create a fully fleshed out customer experience. Vaping really took a foothold in the European and US markets in 2009, so by the time Superior Vapour were looking to open the business, their competitors already had a few years worth of a head start in terms of a digital presence. As such, Superior Vapour were swimming upstream in terms of getting their products to rank as highly as their quality. A year after their business opened online, Superior Vapour started looking into SEO in order to drive higher traffic and sales, however, with only a small team and day to day priorities, they were worried the company wouldn’t have enough time, or expertise, to deal with the complexity of running a successful SEO campaign and significantly raise their profile. A large site with a vast array of varied products which all needed optimising along with categories. Want outstanding SEO results for your business? Working closely with the team at Superior Vapour, we aligned our strategy with their vision of growth for the business. With the difficulty regarding placing content and advertisements off-site, we focused all our efforts on creating higher quality, well-optimised content for the website, and driving outreach through targeted social media campaigns. As vaping has grown as a business, so has the culture surrounding it. We planned to tap into the vast and engaged culture of vaping by utilising the on-site blog to its full potential. By creating well researched, high quality and informative content, on statistically hot and culturally trending topics, we improved site rankings (Google loves good content) with the added benefit of developing an invested community of genuine vape enthusiasts. But that’s not all. As the blog and business continue to grow, we aim to develop our content strategy further with exciting multimedia content, interviews with the biggest members of the vape community, and cross-channel collaborations – cementing Superior Vapour as the premier vaping lifestyle blog. We don’t force or use artificial backlinks at Superb Digital, so with a portfolio of content that was both relevant and eminently readable, we approached bloggers and members of the vaping community with well-established audiences to place content on their websites. Thinking around and outside of the box, we contacted members of lifestyle blogging communities that had just given up or were trying to give up smoking, providing informative advice on the benefits of vaping. Despite the size of the website and the variety of products, we provided an in-depth audit and extensive re-write of all the copy, ensuring that category and product descriptions were well optimised to maximise both sales and Google rankings. Our bespoke vape SEO service means we were able to maintain the readability and strong brand voice of Superior Vapour and still satisfy the visitors’ needs for in-depth and detailed product information. Whilst Superior Vapour had existing social media channels, their followers were low and there was no clear brand message. By enforcing a consistent brand approach in all posts and developing a multi-channel outreach campaign – connecting with enthusiasts, running competitions and creating shareable and interactive content – we doubled their reach on Facebook and quadrupled their following on Twitter within the first few months. During the time we’ve worked together we have been able to provide significant quantitative and qualitative results for Superior Vapour. Outside of the whopping increases in revenue and traffic, the holistic effects of our SEO and digital marketing services to the Superior Vapour team were also great. Knowing that the online face of his business was in good hands, allowed Leigh and his team work more on developing the website and expansion of the business. After a few months, we started to see results – our store started to take more revenue, visitor traffic was increasing every month and our products were starting to appear on page one on google – some of them were the first result on page one! After approaching two other SEO companies, Superior Vapour chose Superb Digital because of our intimate and exhaustive approach. We’re not a faceless Bristol SEO company, we spend time cultivating unique relationships with each of our customers, working in a partnership, or fitting into your existing team, to fully facilitate your business’s growth. Growing his business organically and expediting its success as an e-commerce site into an evolving lifestyle brand was a highlight of Superior Vapour’s business plan, so the quality of our content and creativity of our content strategies was a key factor in deciding to choose Superb Digital. We think providing unique and bankable content for every one of our clients is worth the work. We are so pleased with the services that Superb Digital have provided. We looked around for a good SEO company and let’s face it, there are 100’s online. You know you’ve found a company who know what they’re doing when they appear on page one of your search results! The no.1 SEO company in town! Our proven SEO methods can work for your business too.